Settle down for your favorite movie knowing there's a chance your eye will be drawn away from the screen. The Amish Modesto Mission Entertainment Center is an exquisite display of the finest mission style furniture available today. The Modesto defines warmth and beauty in every corner, tapered leg, cabinet door and spacious drawer. The Modesto is everything you'll ever need in a luxury entertainment center. Mission style furniture has long been revered for its outstanding beauty that is expressed in a simple form. The Modesto is built by the Amish with a strength your family can rely on and a beauty they will enjoy using. The construction and premium quality materials used for this mission furniture contributes to saving you money. This is an Amish made entertainment center that will not have to be replaced, but instead will last to be enjoyed by future generations. For all those special movie nights and family gatherings in front of the TV, make the Modesto your choice for your living room or family room. 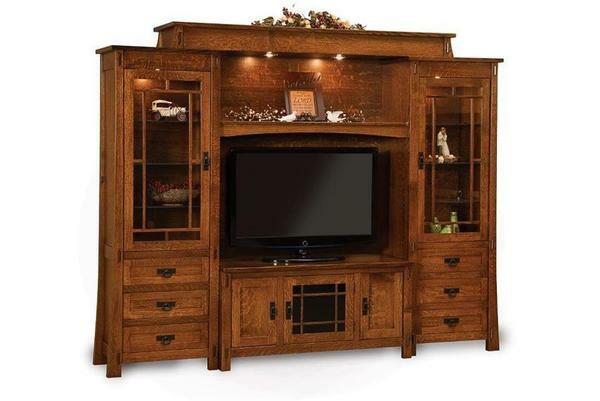 This solid wood entertainment center is featured in the Modesto Living Room Set from our Shop the Look Collection. View room ensembles with the Amish furniture you love from Shop the Look. Our experienced Amish Furniture Specialists are standing by to answer your questions and assist you with your order. Call us today, toll-free at 866-272-6773. We just received the Custom Entertainment Center/Bookcase/Bridge last month in our home and it looks great.